Campbell County Memorial Hospital in Gillette, Wyo. Taxes on property, coal and oil support the county-owned hospital, but revenue has dipped because of dwindling population and a rising number of uninsured residents amid the layoffs. Wyoming, so far, has chosen not to expand Medicaid under the Affordable Care Act. The promise of the Affordable Care Act for hospitals was that bad debt—a figure that reflects bills a hospital can't collect—would shrink substantially under the law's coverage expansions. The reality, so far, is less uniformly dramatic, even though 20 million fewer Americans are uninsured. Even in states that agreed to expand Medicaid, the popularity of high-deductible plans in those insurance exchanges has added to hospitals' mounting concerns over how patients can pay those bills, if at all. The promise of the Affordable Care Act for hospitals was that bad debt would shrink substantially. The reality, so far, is less uniformly dramatic. In Wyoming and other states that did not expand Medicaid, hospitals are seeing little relief from patients who can't pay their bills or need financial aid. “It's not improving for us here,” Huber said. Campbell County Health's bad debt increased 42% between 2013 and 2015. 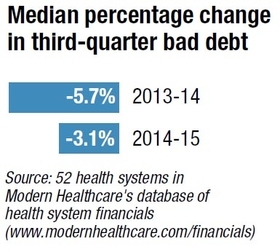 Modern Healthcare reviewed the bad debt reported by hospitals and health systems for the third quarter of the calendar year in 2013, 2014 and 2015. The 52 hospitals and health systems in the sample are ones with figures for all three years in Modern Healthcare's financial database. 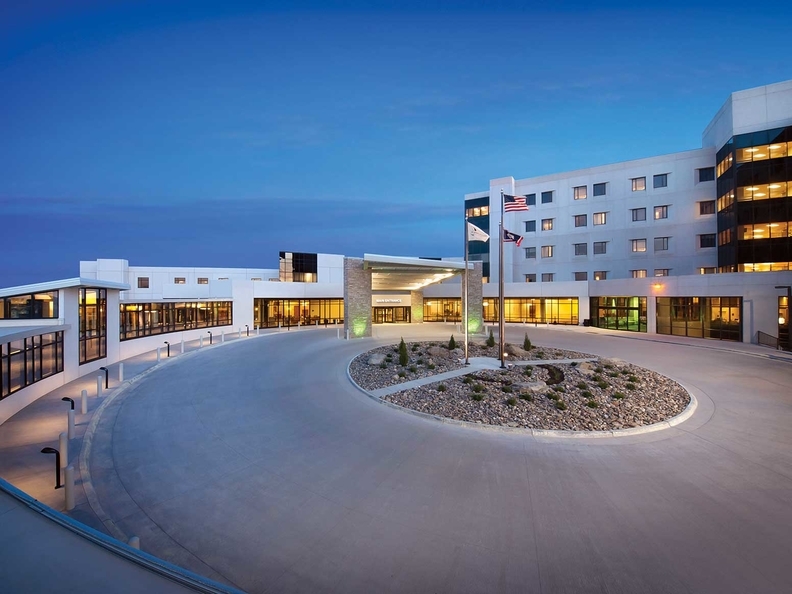 They include some of the nation's largest multihospital systems, such as Ascension Health, St. Louis, and Catholic Health Initiatives, Englewood, Colo. The median change over the period was a 5.6% decline. But the mix of ups and downs underscore the ways that the ACA is unevenly remaking hospital finances. Medicaid expansion has reduced unpaid bills and the need for hospital financial assistance. Yet hospitals now write off growing losses on Medicaid patients. The rising number of people enrolled in plans with high deductibles is prompting new strategies that include loans and more attempts to collect bills before or as patients enter the hospital. “We have seen almost all of our self-pay business disappear,” said Karen Testman, chief financial officer of MemorialCare Health System in Fountain Valley, Calif., using the industry's term for uninsured patients. California is one of 31 states that have expanded Medicaid, and 1.15 million residents enrolled in 2016 coverage through the state's insurance exchange, Covered California. The experience has been much the same at financially struggling Verity Health System, the Redwood, Calif.-based system known as Daughters of Charity Health System until it was sold recently to a private equity firm. “There is such broad coverage now,” said Stephen Forney, Verity's new CFO. Verity saw bad debt drop 57% between 2013 and 2015, and unpaid deductibles are now the focus of collection efforts. “You try to get as much as you can upfront,” Forney said. But that comes at a cost. “It takes more time to pick up the phone and call for a $5,000 deductible than it does to electronically submit a bill” to a health plan, he said. Forney said he's not sure people who needed the Affordable Care Act's subsidies to buy coverage will be able to afford their deductibles. Some hospital executives at multistate health systems said they anticipated, but have not yet seen, a surge in unpaid bills from patients who bought health plans with high deductibles on ACA exchanges. “We did not know what to expect,” said Ryan Thompson, vice president of revenue cycle for Christus Health, headquartered in Irving, Texas. Texas, where Christus operates most of its hospitals, did not expand Medicaid. Louisiana, where Christus has five hospitals, didn't agree to raise Medicaid eligibility until this year. But the system also serves patients who live in Arkansas, which did expand its program. Christus' unpaid medical bills dropped 22% between 2013 and 2015, according to Modern Healthcare's analysis. Thompson said that number drops to 7% when making annual comparisons, because bad-debt figures can vary quarterly. Bon Secours Health System is based in Marriottsville, Md., and operates in a few states. Some of them, including Maryland, expanded Medicaid. But more than half its hospitals are in Virginia, which has not. “I was expecting we would see this huge increase” of high-deductible debt, said Janice Burnett, the chief financial officer at Bon Secours. That did not happen. Patients have sought primary and preventive services that are exempt from deductibles under the ACA, she said. Insured patients also qualify for financial aid when their income is too low and bills are too high, she said. Patient advocates have monitored hospital financial aid policies as the ACA increased commercial insurance coverage among low-income households, said Jessica Curtis, a senior adviser at Community Catalyst. The law required more publicity of financial aid policies, but it still leaves it up to hospitals to determine eligibility criteria. There may be another factor that contributed to the sharp drop in bad debt along with the drop in uninsured: Many hospitals have changed how they count it. Hospitals typically bill uninsured patients more than they bill health plans for the same procedure. Insurance companies negotiate with hospitals to lower prices, but the uninsured may face the higher sticker price. Some hospitals discount prices for the uninsured, but others reported the full sticker price as bad debt. That will change under ACA rules that went into effect last year, limiting what hospitals can charge the uninsured to amounts paid by insurers. Other new rules under the ACA allow hospitals to assume patients need financial aid rather than waiting for proof from an application that may never come. Hospitals can instead rely on information from other sources, such as other financial aid programs. That may increase the number of patients who get financial aid and under the old rules would have been expected to pay bills they could not afford—bills that would end up counted as bad debt.